Within Puglia (the heel of the boot) lies Salice Salentino, the very bottom tip of the heel. Founded in 2003, the Consorzio di Tutela Vini D.O.P. Salice Salentino is dedicated for the protection of PDO Salice Salentino wines. 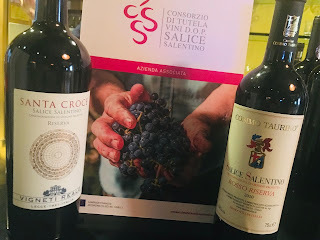 Salice Salentino, which was granted DOC status in 1976, has just over 2,000 hectares of vineyards and the name refers to both the village and the name of the wine. Puglia is a workhorse region in Italy. 50% of Italy’s olive oil is produced in Puglia and 40% of Italy’s wine is produced here. 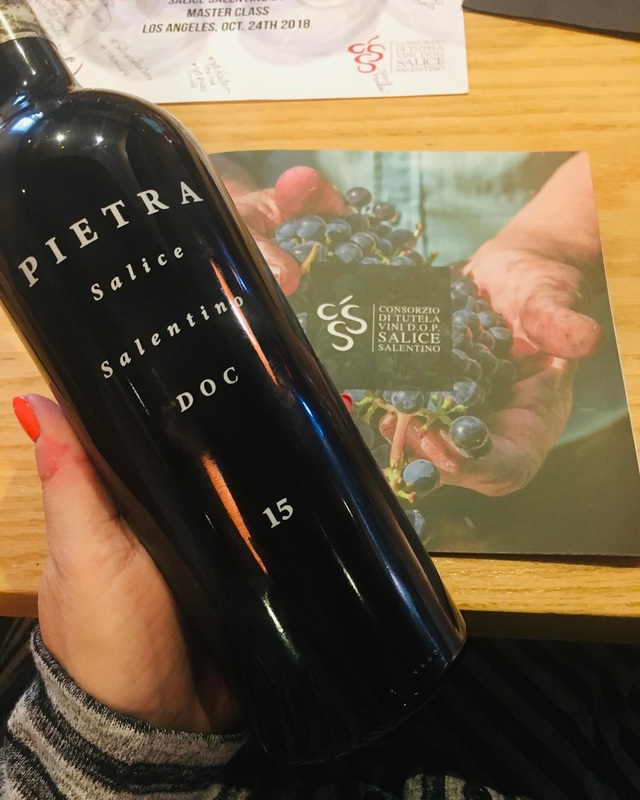 Known as “the California of Italy”, because of the plethora of sunshine here (over 300 days of sunshine per year), many other regions bring in Puglian grapes for blending because the grapes can easily hit desired alcohol levels (partially due to the sunshine levels). The Mediterranean climate is hot and dry and the region lies between two seas, giving good winds which help prevent rot, mold, and insect problems. Historically, as in much of the south of Italy, the wines here were not known for quality. Vines give high yields and the wines carried a baked character. Now, many producers are switching their focus to more quality wines. And here in Puglia, the prices are deceptive. Many, many quality wines can be found around $20/bottle, which in many other wine regions (outside of Italy) wouldn’t get you much. The new generation of producers are focused on modern winemaking techniques and also in “rescuing” and maintaining the use of indigenous varieties. There are over 546 indigenous varieties registered in Puglia, with many more unregistered. The Negroamaro grape is king here. It is usually blended with Malvasia Nera di Lecce to soften tannins. Negroamaro has a super dark, almost black, color. The grape gives high yields and gives notes of black fruit, tobacco, and shoe polish. 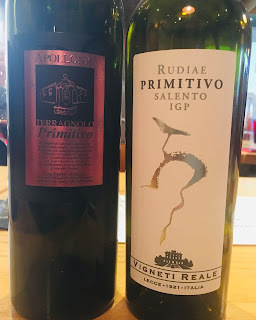 Primitivo is also very important here, though it is prone to uneven ripening, difficult to grow, and is not easy to handle in the cellar. It does accumulate sugar easily (which can lead to wines with higher alcohol levels). Primitivo gives ripe cherries, plums, underbrush, and herbs/tar. White grapes in Puglia include: Malvasia Blanco and Fiano (which is originally from Campania). The red Aleatico is used for a passito-style wine. 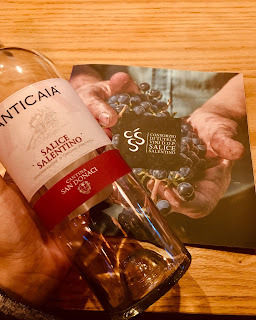 Wine styles include Salice Salentino Rosato DOC, the flagship wine of Puglia, made from the Negroamaro grape. Markers include white peach and passion fruit. These rosatos are made in the press method, not saignée. Next in importance is Salice Salentino Rosso DOC, a red wine made from a minimum of 75% Negroamaro. This wine generally gives blackberry, spice, black licorice, and pepper notes. If Negroamaro is on the label, it is a minimum of 90% Negroamaro. Riserva signifies it’s had at least 24 months minimum aging, with at least 6 months in barrel. Time agrees with Salice Salentino Rosso, and it can age like a mofo. Lastly, we have Salice Salentino Biano DOC made from either Chardonnay or Fiano. Pale salmon color. 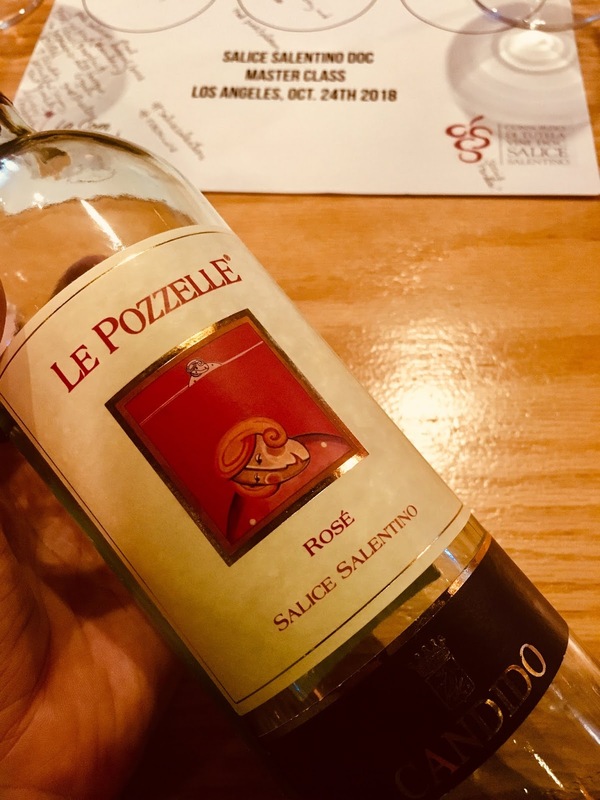 This wine sees all stainless steel (no oak) and gives red fruit on the nose (strawberry), citrus (grapefruit), and herbs (dill, tarragon, oregano), floral, and minerality/brine. On the palate, bracing acidity with a savory/tart quality. Good structure with a licorice/rhubarb finish. Medium pink/salmon color. According to Laura, this wine smells like a ladies setting powder (spoken like a true Italian!). On the nose: ripe strawberry and peaches, plus floral notes (rose petals), and pink peppercorns. On the palate, so many primary fruit and floral notes. Deep ruby color. Red and black fruit on the nose (cherry, plum), spice (black pepper and cinnamon). A rustic and Italian feeling wine. Medium rustic tannins and good acid. Medium ruby in color. This wine sees all stainless steel, no oak, and gives red fruit plus floral on the nose, with a muted spice character. Pale ruby in color. On the nose: soft, delicate red fruit, spice, plus toast/oak. This wine is super smooth on the palate, with good acid. A bit more sophisticated than the first two reds. This wine is in the modern style and can compete on the international marketplace. Organic and sustainable vines. This wine definitely smells like a Riserva due to the longer oak aging. It gives me the holy trinity of what I want in a red wine: red fruit, spice, and oak/toasty notes. A blend of Negroamaro and Malvasia. This wine sees 6 mos French oak aging. With notes of red fruit, pepper/spice, plus dates/prunes. A very savory nose with an herbaceous note. Super spicy on the palate. 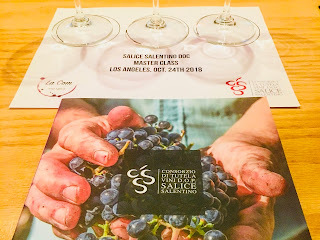 Thank you Laura Donadoni for leading us through the wines of Salice Salentino!